(Source: AppleInsider) Apple in recent weeks has reached out to members of its professional video editing communities to help test a couple of updates to its Final Cut suite of video production tools: one major and one incremental. The first is Final Cut Studio 3.0, the Cupertino-based firm’s second major overhaul to its professional video and audio production suite for Mac OS X bundling component applications Final Cut Pro, Motion, Soundtrack, DVD Studio Pro, Color, and Compressor. (Source: originalprop.com) “Monsterpalooza – The Art of Monsters” will be held at the Burbank Airport Marritt Hotel & Convention Center May 29-21, 2009. This 3-day event is “dedicated to the art of monsters and the artists that create them”. The convention will showcase the work of artists and illustrators, sculptors, and other professionals. (Source: news.awn.com) Nikki Finke reports that Wildbrain CEO Charles Rivkin has been named as the U.S. ambassador to France. The ex-Jim Henson Co. CEO was a big fundraiser for President Barack Obama’s presidental campaign. He is also a member of the Homeland Security Advisory Council — an organization of private citizens that advises the Homeland Security secretary — and the Pacific Council on International Policy. His family has a record as ambassadorships. His father William R. Rivkin served as ambassador to Luxembourg for John F. Kennedy and ambassador to Senegal and Gambia in the Lyndon Johnson administrations. (popularmechanics.com) When Arnold Schwarzenegger’s face appears onscreen in Terminator Salvation, it’s precisely as it should be: wide, menacing and trapped in 1983. If the first three Terminator films were a flipbook portrait of an action star entering middle age, the fourth installment resets the iconic actor’s cinematic clock with a climactic fight scene that blends the latest digital effects with a prosthetic prop that’s been shelved for a quarter-century. The result is the resurrection of the killer robot that launched a franchise—and a feat of time travel that’s worth the price of admission. (Source: darkhorizons.com) MarketSaw have posted (and confirmed with Fox) two new official concept art pieces from James Cameron’s upcoming sci-fi epic “Avatar”. The two bits of art involve a powersuit used by Sam Worthington’s character in the film from the looks of it, and a scene involving the Na’vi alien race native to the planet. Both shots are from “The Art of Avatar” book due out on shelves in December. As these are concept art sketches though, the final design will likely differ. (Source: highend3d.com) Seven companies joined forces at NAB last month to launch The Open Effects Association. This non-profit, UK-based company aims to develop and promote open standards across the visual effects community. Founding members are Assimilate, Autodesk, Digieffects, FilmLight, The Foundry, GenArts and RE:Vision Effects. These companies have helped artists create ground-breaking VFX shots on just about everything that hits cinema screens. 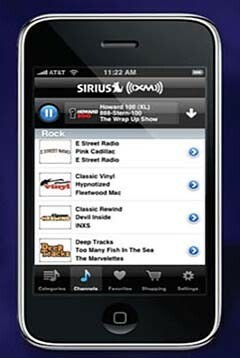 (Source: TUAW) Sirius XM has revealed a screen shot of the soon to be released iPhone/iPod touch app that will stream the satellite channels to eager listeners. The image of the upcoming app was part of an SEC filing that was included in a PowerPoint presentation shown at a recent shareholder meeting. The app, which is expected to be free, will require a US$3.00/month streaming subscription for current subscribers, and a US$13.00 monthly fee for non-subscribers. No specific release date is known, but it is thought to be very soon.